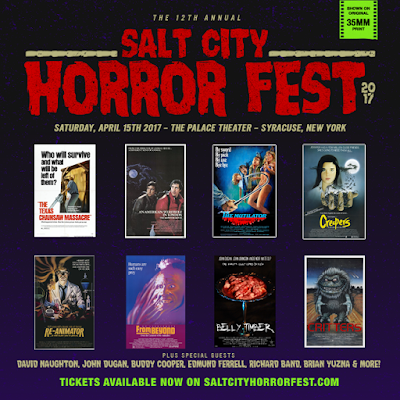 THE B-MOVIE NEWS VAULT: THE 2017 SALT CITY HORROR FEST INVADES SYRACUSE, NY ON APRIL 15TH! THE 2017 SALT CITY HORROR FEST INVADES SYRACUSE, NY ON APRIL 15TH! Syracuse's famous SALT CITY HORROR FEST returns yet again to The Palace Theater with an amazing lineup of 35mm Horror classics! 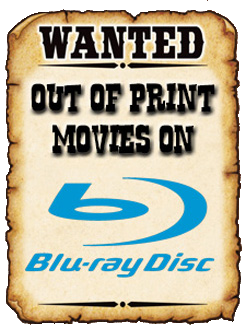 Along with eight films, there will be vendors, and a pretty amazing group of guests attending as well, including: David Naughton (star of AN AMERICAN WEREWOLF IN LONDON), John Dugan ("Gramps" in the original TEXAS CHAINSAW MASSACRE), Buddy Cooper (director of THE MUTILATOR), Richard Band (composer and brother of Full Moon Entertainment's Charles Band), Brian Yuzna (director of RE-ANIMATOR, SOCIETY, FROM BEYOND, et al. ), and more! SALT CITY HORROR FEST takes place on Saturday, April 15th. Doors open at 11 AM, and the show begins approximately at 11:30 AM! You can pre-order tickets HERE for $30.00 (they will be $35 at the door on the day of the show), or spend more (up to $120) to get additional perks at the show! You've got a full month to plan to attend this show Vault Dwellers, so save the date and get your tickets (at www.saltcityhorrorfest.com), and hopefully I'll see you there!